What time opens and closes Den Blå Planet, National Aquarium Denmark? Note: 31 December 10-17 // 1 January 10-21. Where is Den Blå Planet, National Aquarium Denmark? Jacob Fortlingsvej 1, 2770 Kastrup. How much is the entrance to Den Blå Planet, National Aquarium Denmark? Children under the age of 3 is free of charge. 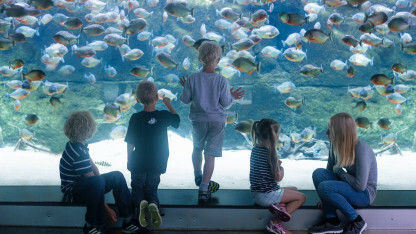 How much is an annual card to Den Blå Planet, National Aquarium Denmark? How do I get to Den Blå Planet, National Aquarium Denmark? Getting to National Aquarium Denmark, Den Blå Planet is easy. You will find National Aquarium Denmark, Den Blå Planet at this address: Jacob Fortlingsvej 1, 2770 Kastrup.Take the Metro: We are located 600 metres from the Metro station. Get off the Metro at Kastrup Station and walk down Alleen in an eastern direction until you reach National Aquarium Denmark, Den Blå Planet. The Metro line is the M2 and it runs every few minutes. Is there a place to store my luggage and coats? Can I bring my dog/pet to Den Blå Planet, National Aquarium Denmark? For the safety of the aquariums’s animals, it is not permitted to bring pets inside the aquarium. Guide dogs are welcome except in the rainforest due to stress level and the danger of infections. Can I bring a stroller to Den Blå Planet, National Aquarium Denmark? How about parking at Den Blå Planet, National Aquarium Denmark? Parking facilities are located in front of National Aquarium Denmark, Den Blå Planet: Take your parking ticket from the barrier system at the entrance. After your visit, pay your ticket at one of the automated payment machines. First scan your parking ticket. Then pay the amount with your debit card. Scan your parking ticket once more as you exit. Can I smoke at Den Blå Planet, National Aquarium Denmark? How about tour busses at Den Blå Planet, National Aquarium Denmark? Can I take pictures at Den Blå Planet, National Aquarium Denmark? Is there wifi at Den Blå Planet, National Aquarium Denmark? Are there defibrillators at Den Blå Planet, National Aquarium Denmark? What do I do if I forgot something at Den Blå Planet, National Aquarium Denmark?